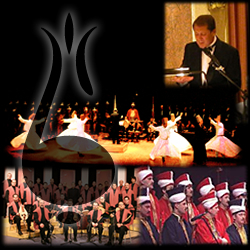 The ensemble, which was started in 1991 by Republic of Turkey, Ministry of Culture, has been founded to present the original style and performance characteristics of the Classical Turkish Music especially the Sufi Music (Tasavvuf) and Military Music (Mehter), which are of the outstanding values of our culture, and to make observations on this area. The ensembles, following this goal, first establish the community of the artists and the other equipment, repertory studies and style performances, now they perform to the audience by giving concerts. The ensemble, formed of two basic parts, Sufi 'Tasavvuf' and Military 'Mehter', has been performing the new songs as well as the high qualified classical songs which had been performed in the Military Sections 'Mehterhane', which was abolished in 1826 with 'Yeniçeri Ocagi' and in the dervish lodges 'Tekke' which was closed in 1925. Also the Military Part 'Mehter' can be seen with the historical uniforms, special standarts such as 'tuğ' and 'Sancak', which are identical to the origin. The Ministry of Culture Istanbul Historical Music Ensemble continues their studies and researches knowing the importance of the historical values of our ancient music, which will help our nation to fulfill the goal of reaching a contemporary status. The ensemble also works on performing our ancient music to present with a view of all the universal dimensions to our art lovers and to entrust this music to the new generations. The ensemble performs the Sufi Music, the other kinds of Classical Turkish Music and the Military Music at hundreds of concerts in Turkey and abroad successfully.